So, you’re thinking about Vietnam as your next holiday destination? Great choice! It is a wonderful country, full of equally wonderful people! Whether you’re interested in food, culture, adventure or just relaxing by the beach, Vietnam has something for everyone! Before you rush online to book your plane or bus ticket, however, you should make sure you do your research to ensure you get the most out of your adventure. One of the first things that you will need to find out is if you need to obtain a Vietnam Visa. Most travelers to Vietnam will need to get a visa before being allowed into the country; there are some exceptions. Countries marked with an asterisk “*” are exempted to June 30th, 2018. An announcement has yet to be made on whether this will be extended. The day you arrive is counted as your first day. Whether you arrive at 12.10am or 11.45pm, that is still counted as day one. The day you leave is also counted as one of your days. So, in effect, if you have a 15 day Vietnam Visa exemption you are allowed to stay in Vietnam for up to 14 nights. If you have a 30 day Vietnam Visa exemption you allowed to stay for up to 29 nights, etc. You will more than likely be required to show proof of onward travel, or proof of exit. 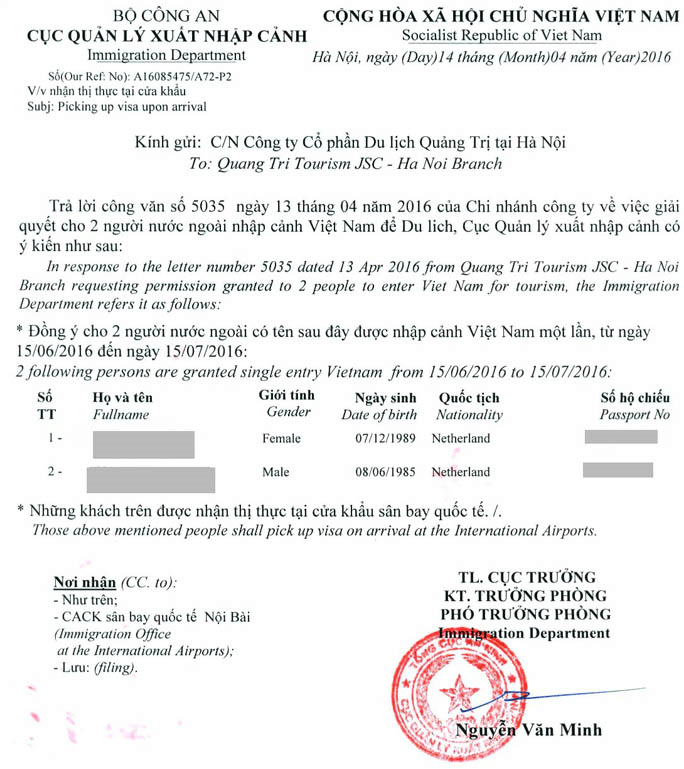 Example – an airline, or bus, ticket out of Vietnam dated within the period of your visa exemption. There is nothing stopping you from returning to Vietnam within 31 days, but you will need to arrange a Vietnam visa to re-enter. This is quite common as many people enter Vietnam, stay for a few days, and then do a side trip to to another country, before returning to Vietnam. In a situation like this, one of the entries can be under the visa exemption, and the other using an embassy issued visa or VOA (Visa on Arrival). It doesn’t really matter which is used for which entry, so long as the exemption is used for a stay of 15 days or less. If you decide to get a VOA (visa on arrival) instead of an embassy issued visa, please be aware that a VOA is only valid for air travel. A VOA cannot be used at a land border crossing. If you come from a country where the visa exemption doesn’t apply to you, or you’re planning on staying longer than the period you are visa exempt; you have a couple of visa options: Embassy issued visa, or VOA. Ok, you’ll need to contact the Vietnam Embassy or Consulate in your home country to find out exactly what they require, as well as the cost. Fees obviously vary from country to country, and, if you don’t live near the Embassy, you may have to post your passport in to receive the visa stamp. This will add to the overall cost of your visa however, and you will risk putting your passport in the hands of your postal service. Some Embassies may offer you the option of a loose leaf visa, which would negate the need to post your passport. 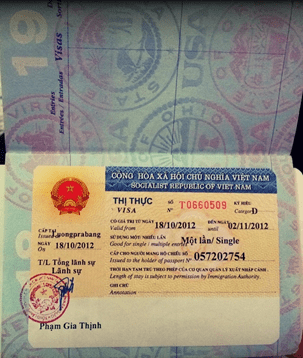 Once you have your passport back with a Vietnam visa, you are good to go. There will be nothing more to pay on arrival in Vietnam, and when you do arrive, proceed directly to Immigration / Passport control. Not interested in using the Embassy, and like the sound of using VOA? And you’re entering by air at one of these airports? You’ll save some money, and you won’t have to trust your postal service with your passport. You will have to spend a little extra time at the airport organizing your Vietnam visa when you arrive. Well, that depends on how many other people arrive at the same time, who also require a VOA. The wait could be anything from 10 minutes to 2 hours, with it generally being much closer to the shorter time frame, than the longer. You can pay extra for expedited service, but it’s often not required. So, what do you need to do to arrange a VOA? First, you need to get an official approval letter from one of the many VOA agents out there. The fee for this service varies from provider to provider but starts at around $15-25 USD. You can find info for reputable VOA providers on our site in the menu. Your VOA agent should email you your approval letter a few days after you pay their service fee. 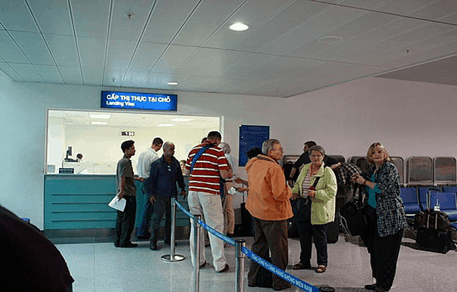 Please keep in mind that the VOA approval letter is not an actual visa, but a letter that is handed in at the VOA counter, to enable you to receive a visa stamp once you arrive at the airport in Vietnam. Do not be concerned if there are other names on the letter as it’s quite common for agents to make visa applications in bulk. If this does concern you, then most agents can arrange a private letter for you. There is normally an extra fee for this, however. Once you have received the approval letter, print it out in its entirety. The VOA agent will also send you an “Entry and exit” form, and this also needs to be printed out. This form needs to be filled in, and it’s a good idea to do this prior to travelling, so as to save time when you arrive. You will also need to supply a passport sized photo, as well as the visa stamping fee in US dollars. When you arrive, head straight to the VOA or Landing Visa window. Do not line up at Immigration / Passport control. Once you are at the window, hand over your passport, the approval letter, the completed “Entry and exit” form and one passport photo. Then take a seat and wait for your name to be called. When your name is called, return to the counter and collect your now stamped passport. The stamp looks much the same as the Embassy issued visa. The visa fee is now paid, which is $25 USD for one and three month single entry visas, and $50 USD for one and three month multiple entry visas. Be sure to check the visa dates in your passport while still at the counter. When all this is done, you can proceed to the Immigration desk, followed by collecting your luggage on the way out. A relatively new option is the E-Visa. Please don’t get it confused with the VOA, (visa on arrival) because while it’s similar in that you apply online, it is a very different system. If you find any other site purporting to issue e-visas, or any site with the word ‘e-visa’ in their domain name, be aware that they will be acting as a third party. And by acting as a third party, they will charge you a fee for the privilege. So, what is an e-visa? An e-visa is a one-month single entry visa, only. So if you need a multiple entry visa, or are staying in Vietnam for more than 30 days, then you will need to use either the VOA system, or obtain your visa through the Embassy. What is the cost of an e-visa? The fee, which is paid at the time of application, is $25 USD. There is also a small handling fee of around $1 USD. This makes it the cheapest way to obtain a visa for Vietnam. 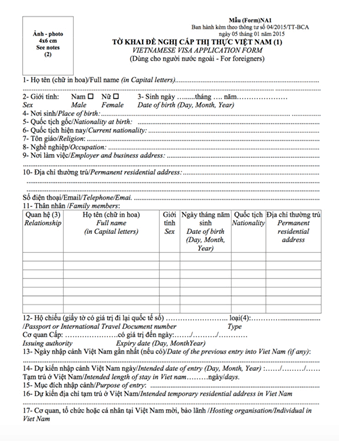 We hoped you found this Vietnam Visa guide useful! If Ho Chi Minh City is one of your stops in Vietnam, you might consider checking out one of our 4 acclaimed city tours. XO Tours has been the #1 ranked tour company in Vietnam for over 7 years running, as voted by the users of Tripadvisor. Our XO “Foodie” tour is the original Vietnam street food tour and was recently named one of the top 9 food tours in the world by Forbes magazine. Scott Jones lives in Melbourne, Australia. After having never previously travelled overseas, he is now planning his third trip to Vietnam in three years. It is fair to say he has fallen in love with both Vietnam and its people! Writing about the country has now also become his passion.